If you believe most marketing material, it would be easy to come to the conclusion that great ideas are the primary driver of investment performance. Examples of how a manager uncovered great companies trading at a discount or ones who made a big profitable macro calls are plentiful. Great calls are often what the media gravitates to, as evidence of a solid investment process. It certainly provides great sound bites. While great ideas are certainly one of the important ingredients to strong performance, avoiding making mistakes rarely sees the same fan fair. Yet avoiding mistakes is often a bigger contributor to overall performance, it just isn’t that exciting and doesn’t get the same amount of press. One of the more prevalent behavioural biases that leads to investment mistakes is Loss Aversion. Loss aversion stems from the well researched finding that we feel the pain from losses more so than the pleasure from an equal sized gain. For example, if losing $100 causes the disappointment/pain of X, then gaining $100 causes the pleasure of ½ X. To demonstrate this behaviour in an investment framework, consider the chart and two investments you made a year ago. Both cost $100, one worked out well while the other, not so much. Now you need to sell one, to raise cash for another purchase. Which would you sell? You could sell XYZ. If you did, you feel good as you made money. It’s a win, everybody likes that feeling. It removes the risk of doing the round trip back to your cost. And even if it keeps going up, it is still a win. You could sell ABC. In this case, a paper loss becomes a real loss, yuck. And what if it recovers? You will feel the fool for bailing out at or near the bottom. 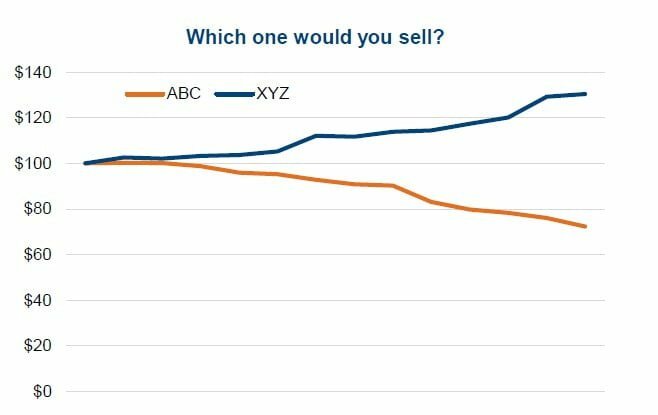 Choosing to sell XYZ over ABC may be evidence of loss aversion. You are trying to avoid realizing the loss and the disappointment/pain associated with it. Clearly ABC is not working out, but how many times did you say, ‘I will just wait till it comes back to my cost then get out’? This is often called get-evenitis. Plus, re-anchoring XYZ at $130 or so, selling this one also removes the risk of pain should it fall. Loss aversion can often lead investors to hold onto losing investments too long and sell their winners too early. 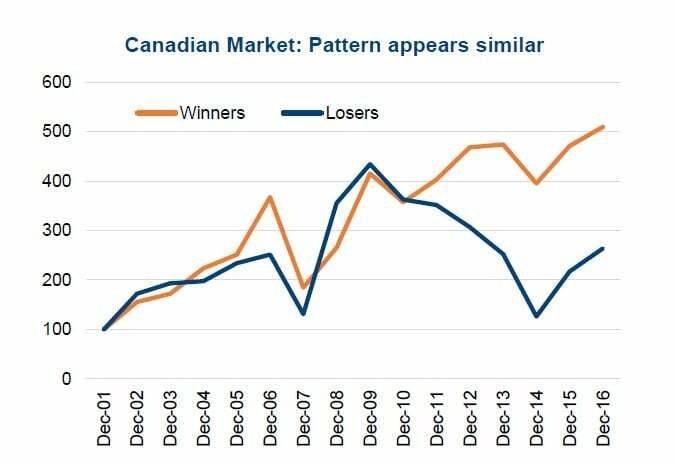 We did a simple analysis, using the S&P 100 for the U.S. equity market and the TSX Composite for Canada. At the end of each year, the index constituents were sorted by their trailing one-year performance. The top 20% were deemed to be ‘Winners’ and the bottom 20% ‘Losers’. We then tracked the Winners and Losers for the subsequent year, then repeated the ranking process at year-end. The top chart is the U.S. market and the 2nd chart is Canada. 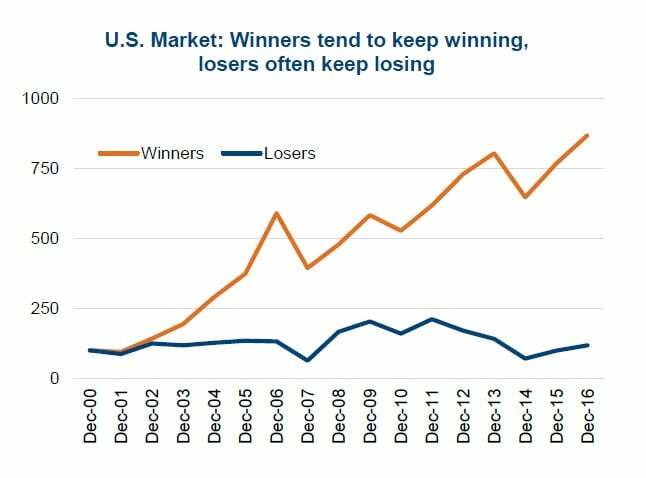 While there are some years when the losers do better, the broader trend appears to be winners tend to keep winning and losers tend to keep losing. For those suffering from loss aversion, selling winners and holding onto losers, you can see how this could negatively impact performance. And we didn’t even bring in taxes. If you add the tax drag of selling your winner vs. the tax benefit of generating a capital loss, it makes even more sense to sell the loser and keep the winner. In the Redwood Behavioural Opportunities Fund which we manage, we wanted to develop a trading strategy that could help us avoid or manage loss aversion. We acknowledge it is often not easy selling something for a loss, even if it can sometimes be the right thing to do. We also wanted to develop a more systematic approach. A big loser in a portfolio is often called a torpedo, as it can blow up all the positive performance from other positions. At first blush, one may consider simply using stop-loss orders on positions. For example, if the stock goes down 10% or 20%, then you sell and move on, avoiding it becoming too big of a loser. This approach has two serious flaws. If you are doing this now, stop it. The 1st flaw is markets have changed and on occasion suffer from what is called a ‘flash crash’. These are very temporary break downs in the markets due largely to program trading. Without going into the details, it can cause markets or securities to dramatically drop in value that proves extremely short term, often measured in minutes. Live stop-loss orders could be triggered by this, leaving the investor with cash executed at a low level even though the prices have largely recovered. Lesson here, don’t use live stop loss orders. Instead, use market alerts and then decide to execute. The 2nd flaw is if the overall market experiences a correction, many of your stops could be triggered. If the correction then recovers, you have just liquidated much of your portfolio at an inopportune time. Dynamic Stop Alerts – To avoid these flaws, which could become investment mistakes, we developed a system that uses dynamic stop alerts. We use alerts instead of live stop-loss orders to avoid the risk of a flash crash. The stop-alerts are dynamic, in the sense they move with the overall market. Should the market drop 5%, all our stop levels would drop by 5% as well. This avoids triggering a bunch of stops in a correction and ending up sitting on a pile of cash. This approach helps us exit positions that simply aren’t working before they erode too much capital. The other side of Loss Aversion is not selling your winners too early. For this we use Reset levels that are set on all positions. An example would be a purchase at $50 could have a $57 reset level. If the $57 is reached, we don’t sell, instead we raise the stop-loss to be closer to the current price. This lets the winner keep running and should it turn, realize the gains at a higher level thus avoiding a round trip back to where we started. Investing is part having good ideas and part avoiding mistakes. None of us can avoid all of them, but the more mistakes avoided, the greater your success will be in the markets.